“In the heart of clubland, a few doors away from Piccadilly Circus, there was opened recently one of the most interesting clubs in London, especially from the decorative point of view. 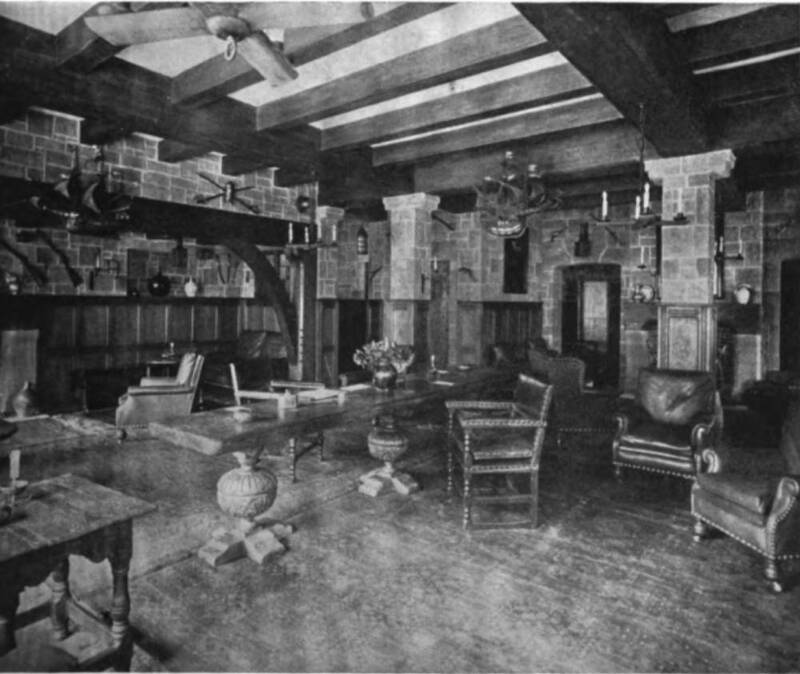 The photograph reproduced here is of the "Buccaneer" Room, the most quaintly, as well as luxuriously, decorated room in the club, which has been named after Carlyle. Used as a smoking chamber, it has been remodelled on the lines of a baronial hall or the guest room of a famous seaport inn of the sixteenth century. The strength and power of the frequenters of such apartments are here suggested by the rough stone walls, the heavily timbered oak beams, and the massive oaken tables, with their quaint, hand-carved legs. Around the walls are hung accoutrements and other articles reminiscent of the battlefield and the chase, as well as a number of rare paintings; whilst from the oak ceiling-beams are suspended models of fighting and merchant ships. The Club also has a room specially dedicated to Carlyle and containing numerous relics of the great writer. Messrs, Waring and Gillow carried out the remodelling and decoration of the Club” (49-50). “Studio-Talk.” International Studio. 55 (1915): 49=50. Hathi Digital Library Trust internet version of a copy in the Cornell University Library. Web. 7 October 2017.